Well, last week I too my wife's 3006 out to shoot a group. First time to the range in ...too long. I wanted to make sure the thing would shoot before I sold or traded it and having never firing it or even seen my wife fire it just wanted to be sure. 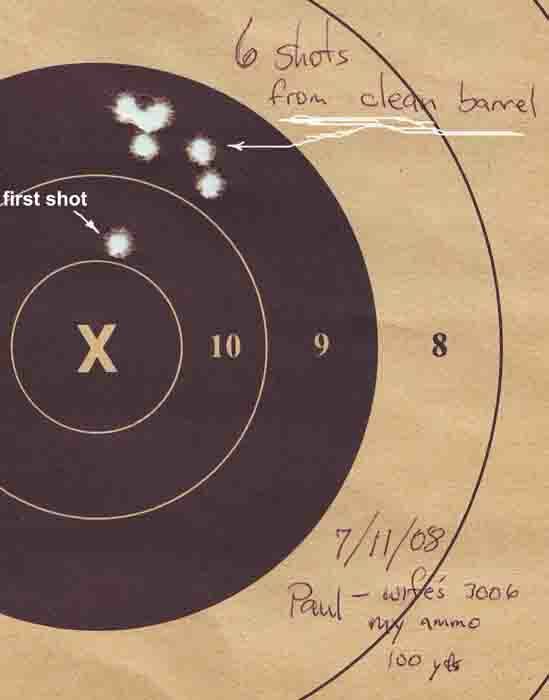 My old eyes had a lot of trouble with the peep site but managed a 1.125" six shot group and one fouling shot all by itself. The load worked in my 3006 but I didn't know what to expect from it in her rifle. You shoot it or did your wife shoot it? I am selling the rifle and keeping the wife. I shot this group with ammo that I had worked up in my 3006. Mine will hold .5 to .75" groups at 100 yds with that load but the guns are different and those peep sights are hard to deal with when you can't see the front sight and target clearly at the same time. It is at least a hunting gun as it is and with a good scope it may do a lot better. This was my first time back at the range since I broke my back three years ago. The next day I felt it too! I think I will limit my '06 shooting to five rounds next time and see how that treats me. If I don't hear from the guy who already said he wanted it I will post it for sale here. 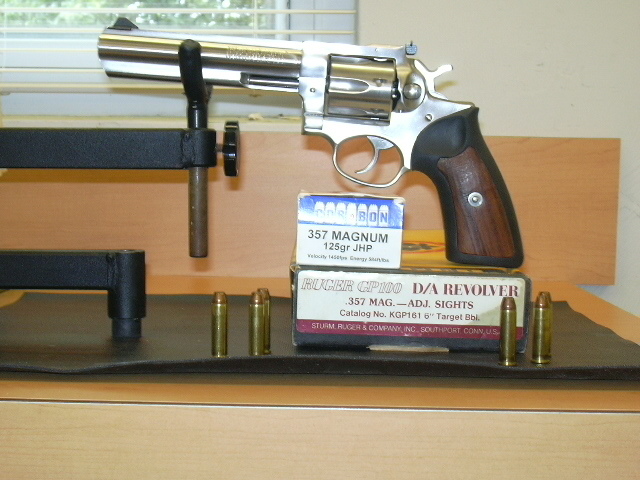 I really want to trade it for a Ruger 357 - that is what I will do with the money anyway. My wife can shoot a pistol - she just isn't comfortable shooting a rifle anymore. What model Ruger were you lookin' for? I would like to get an old Security-Six but I am really open to most anything Ruger. I have a GP100 with a 6 inch barrel that I don't use very often. I've carried it while deer hunting, but have never fired it at an animal. It has a few scratches in the wood grip insert on the left side (I had it on my hip while I was setting treestands, and didn't realize the stand was scratching the grip, and YES, it was unloaded). The only reason I hesitate to get rid of it is because it IS legal for deer here, whereas a .30-06 isn't. I seem to remember you posting some pics of the rifle here, but can't seem to find 'em. The GP-100 is a nice, solid revolver! I watched a buddy shoot a 0.75" group at 25 yards (off a bench) with his. I'll see if I can find the post and point you to it... or just post some here. 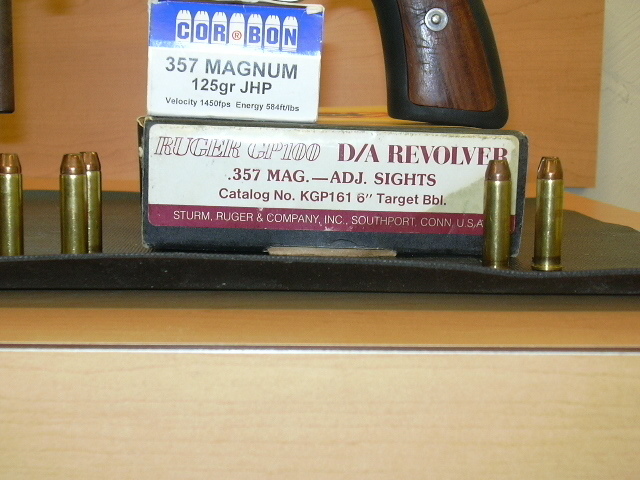 That Ruger is still a good looking gun - it is almost identical to my S-S 6" but a few years younger... Mine still shoots well too. Well, the other two guys have backed out, I guess, so the rifle is back for sale or trade.